Thank you for accessing the website ("Site") of Thomas Labs, LLC. We respect your privacy and want to protect your personally identifiable information. To learn more, please read this Privacy & Security Policy. This Privacy & Security Policy explains how we collect, use and (under certain conditions) disclose your personally identifiable information. This Privacy & Security Policy also explains the steps we have taken to secure your personal data. Finally, this Privacy & Security Policy explains your options regarding the collection, use, and disclosure of your personal data. By visiting our Site, you accept the practices described in this Policy. We are not responsible for the content or privacy practices on any non-Thomas Labs, LLC website ("Site") to which this “Site” links or that links to this “Site”, regardless of affiliation if not owned by Thomas Labs, LLC. Thomas Labs, LLC, respects your privacy rights and will provide you with reasonable access or reporting about any personal data you may have provided, or we may have captured, through the use of our services, both online and offline. If you wish to amend any personal data we hold about you or wish for deletion of personal data from our site(s), databases, or records, you can easily contact us through our “contact” sheet, by email: info@thomaslabs.com, or by phone: 800-359-8387. At your request, we will have personally identifiable information, or any reference to you deleted or blocked from our site(s) and databases. You may update, correct, or delete your Account information and preferences at any time by accessing your Account settings page (if you registered on our site(s), or by contacting us directly as outlined above. Please note that while changes you make may reflect in active user databases, and on the site(s), instantly or within a reasonable period of time, we may retain all information you submit for backups, archiving, prevention of fraud and abuse, analytics, satisfaction of legal obligations, or where we otherwise believe we have a legitimate reason to do so. You may decline to share certain Personal Data with us, in which case we may not be able to provide to you some of the features and functionality of our site(s) or services. You may, at any time, object to the processing of your personal data, on legitimate grounds, except if otherwise permitted by applicable law. Registration and Ordering. Before using certain parts of this Site or ordering products, you must complete an online registration form. During registration, you will be prompted to provide to us certain personally identifiable information, including but not limited to your name, shipping and billing address (es), phone number, email address, IP Address, MAC (media access control) machine address, and credit card number. These types of personally identifiable information are used for billing purposes, to fulfill your orders, to communicate with you about your order and our site, and for internal marketing purposes; including price and product comparison. If we encounter a problem when processing your order, we use the personal data to contact you. Email Addresses. Several locations of the Site(s) permit you to enter your email address for purposes including but not limited to: to register for a free product giveaway; to request an electronic version of our catalog or to sign up for special offers. Your participation in a contest is completely voluntary, so you have a choice whether to participate and disclose information to us. We use this information to notify contest winners and to award prizes. We may post on our Site the names and cities of contest winners. We will not share or sell your email. This information will only be used for tracking purposes and to give you further information about Pet Nutrition Products. We may use third-party advertising companies to help us tailor site content to users or to serve ads on our behalf. These companies may employ cookies and web beacons to measure advertising effectiveness (such as which web pages are visited or what products are purchased and in what amount). Any information that these third parties collect via cookies and web beacons is not linked to any personal data collected by us. Product Testimonials. You may choose to submit a customer testimonial. If you post a testimonial, we will ask for your name. If you submit a review, your first name and the initial of your last name will be visible to other users. Also, any personally identifiable information that you submit as part of the review can be read or used by other visitors to the Site. We are not responsible for any personally identifiable information that you choose to submit as part of your testimonial. We believe you can post a helpful testimonial without disclosing any personal information. Internal Use. We use your personally identifiable information to process your order and provide you with customer service. We may internally use your personally identifiable information to improve our Site's content and layout, to improve our outreach and marketing efforts (including marketing our services and products to you), and to determine general marketplace information about visitors to this Site. Communications with You. We will use your personally identifiable information to communicate with you about our site and your orders and deliveries. Also, we may send you a confirmation email when you register with us. We may send you a service-related announcement on the rare occasions when it is necessary (for example, if we must temporarily suspend our service for maintenance.) Also, you may submit your email address for reasons such as to register for a free product giveaway; to request an electronic version of our catalog or to sign up for special offers. If you submit your email address, we use it to deliver the information to you. We always permit you to unsubscribe or opt out of future emails (see the opt-out section, below, for more details). Because we have to communicate with you about orders that you choose to place, you cannot opt out of receiving emails related to your orders. We will not sell (or trade or rent) personally identifiable information to other companies as part of our regular course of business. However, it's possible that we might acquire or merge with or be acquired by another company or that we might dispose of some or all of our assets. If that happens, your personal data may be disclosed to another company, but that disclosure will be subject to the Privacy & Security Policy in effect. We may share non-personal data (such as the number of daily visitors to a particular web page, or the size of an order placed on a certain date) with third parties such as advertising partners. This information does not directly personally identify you or any user. Your personally identifiable information will not pass into the data layer of third party service partners. We may publicly disclose the name, city, and state of the winner of our product giveaways unless specifically told in writing not to do so. This Site incorporates physical, electronic, and administrative procedures to safeguard the confidentiality of your personally identifiable information, including Secure Sockets Layer ("SSL") for all financial transactions through this Site. We use SSL encryption to protect your personal data online, and we also take several steps to protect your personally identifiable information in our facilities. Access to your personal information is restricted. Only employees who need access to your personally identifiable information to perform a specific job are granted access to your personal data. Finally, we rely on third-party service providers for the physical security of some of our computer hardware. We believe that their security procedures are adequate. For example, when you visit our Site, you access servers that are kept in a secure physical environment, behind a locked cage and an electronic firewall. While we use industry-standard precautions to safeguard your personally identifiable information, we cannot guarantee complete security. 100% complete security does not presently exist anywhere online or offline. (a) If you have an account with Thomas Labs, LLC (thomaslabs.com) we will retain your information for as long as your account is active or as needed to provide you services. We will retain and use your information as necessary to comply with our legal obligations, resolve disputes and enforce our agreements. (b) If you are a visitor to the Thomas Labs, LLC (sites) we will retain your information for as long as necessary but no longer than one (1) year after your last visit to our site(s). Upon your request, we will (a) correct or update your personally identifiable information within 72 hours of receiving and acknowledging a request for correction or deletion; (b) stop sending emails to your email address; and/or (c) disable your account to prevent any future purchases through that account. 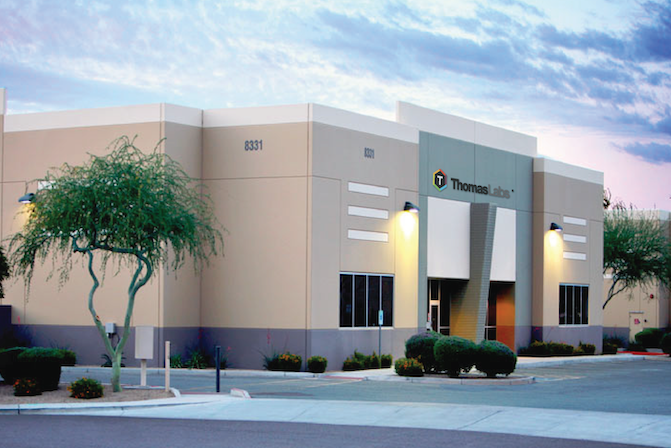 You can make these requests by contacting our Customer Support, calling department by phone: 1-800-359-8387, email: info@thomaslabs.com, fax: 623.936.4499 or mail: 8331 w Sherman St, Tolleson, AZ 85340. Data retention and deletion of “expired” (outlined in line (b)) information only applies to “guest” information. “Guest” information is any personally identifiable information gathered from interaction of non-registered user with our site(s), including, IP Address, guest location, email, phone number, or other information voluntarily provided or captured from tags or site cookies. Email Opt-in, Subscription Opt-in, or registered customers, whether having purchased directly from the site or not, are considered active users unless specifically opted out by the user through email, contact form, phone, or in person. As you might expect from Thomas Labs, the majority of information that we collect is obtained through our Site, and this Privacy & Security Policy applies only to that online collection of personally identifiable information. We may also collect information offline, where we also try to protect the privacy of your personal data. One example involves someone calling us to place an order or to ask questions. When someone calls, we will ask only for the personally identifiable information we need in order to place the order or to answer the question. When we need to store information (such as order information) we will enter it into our database through SSL encryption. (See the Data Security section above for more information). Another example involves faxes. If you fax something to us, we will act upon the fax and then either store it a locked repository or we will shred the fax if there is no need to retain the information. There are other ways we could learn of personal information offline (for example, we suppose someone could send us a letter including some return address information), and this Policy doesn't discuss or try to predict all of those methods or uses. As we mentioned, we primarily sell merchandise, not information, and we will try to treat offline collection, uses, and disclosures consistently with our relevant online practices. If we change or update this Privacy & Security Policy, we will post changes and updates on this Site so that you will always be aware of what information we collect, use and disclose. We encourage you to review this Privacy & Security Policy from time to time so you will know if the Privacy & Security Policy has been changed or updated. If you have any questions about the Privacy & Security Policy, please contact us toll-free at 800-359-8387 or info@thomaslabs.com.